I agree with the editors of techweez the Huawei Y9 (2019) is easily the best mid-range smartphone we have seen yet. Such a bold claim, cannot hold any water if there’s no evidence to prove it, for this reason, we put the Huawei Y9 (2019), OPPO F9 and Samsung Galaxy J8 (2018) in a ring for some knockout session. In this comparison, we shall focus on specs, performance, camera and crown it all up with value for money. All three devices perform relatively the same when it comes to handling everyday opening and closing of apps, the differences in how long an app stays in memory comes down to individual software tweaks and RAM management. However, when it comes to gaming, things become evident that more RAM is an advantage. The Y9 and F9 have pleasant gameplay with virtually no lag, the Galaxy J8 on the other hand, has a few stutters here and there, mostly thanks to its 3GB RAM. All three phones have some form of software-based performance enhancement feature while gaming, but during my testing, Huawei’s GPU Technology and Game Suite app offer the best experience among the three. All three phones have dual cameras on the back but only the Y9 has a similar setup on the front. The Huawei Y9 (2019) has a 13MP lens coupled with a 2MP lens. The front features a 16MP lens and a second 2MP lens, bringing the total number of cameras on the Y9 to four. The OPPO F9 packs a dual 16MP plus 2MP setup and a class-leading 25MP selfie camera. Lastly, the Samsung Galaxy J8 features a dual set up of 16MP and 5MP lenses and a 16MP selfie shooter. The Samsung Galaxy J8 (2018) retails for a recommended price of N102,000, which seems like a lot considering it was the least exciting of the three. 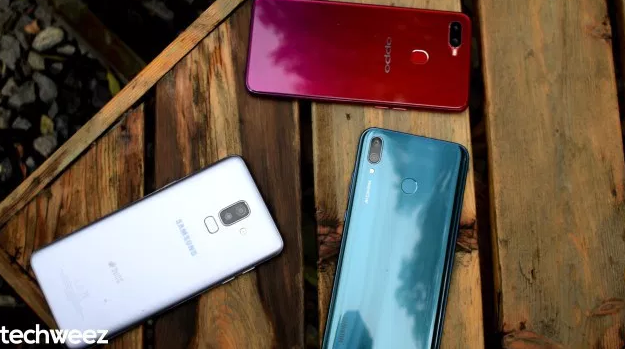 The OPPO F9 retails for N1O5,000 while the Huawei Y9 (2019) retails for N75,990. With such a tight competition, it all comes to brand preference and more importantly, the health of your pocket.